The debate between a traditional manual transmission and fully automatic or automated transmission in on-highway trucks wasn’t much of a discussion just a few years ago. Manual transmissions were the hands-down preferred shifting mechanism. But that isn’t necessarily the case today as the industry desperately searches for ways to increase the pool of tractor trailer rig drivers. Technological advancements have helped move the discussion more toward automated versus fully automatic. Both give fleet managers a selling point to drivers who don’t want to worry about handling a traditional manual transmission. Manual clutch transmissions ruled the highways for decades. Drivers felt the option gave them the best ability to control the vehicle. Drivers complained that the early automatic transmissions shifted gears in an uneven fashion and had trouble finding the correct gear when climbing a hill. But now fully automatic and automated rig transmissions are being considered for two primary reasons. The first is technological advancements. Today’s automated and fully automatic transmissions do a better job of communicating with engines thanks to onboard computers. Secondly, companies are struggling to find drivers. By doing away with a manual transmission, companies hope to draw a bigger pool of people who might consider driving as a career. More vocational schools are equipping training vehicles with automatic transmissions to help recruit new truck drivers. The decision then is for fleet managers to decide whether to go with the automated or fully automatic transmission new drivers have trained on and are used to. An automated transmission works essentially the same as a manual version. Between shifts the clutch is disengaged, the gear is selected, and the clutch is reengaged. The difference is that the gear is changed by an electric or pneumatic actuator. There is no need to push in a clutch and use your hand to make the gear shift. But its similarity in operating much like a clutch comes with familiar maintenance requirements. Clutch adjustments and greasing, torque interruption and ultimately clutch replacement result in interruptions in productivity and higher maintenance costs when compared to a fully automatic transmission. A fully automatic transmission like ones manufactured by Allison Transmission use a torque converter to seamlessly handle the shifts. Allison’s patented torque converter experiences virtually no wear, meaning vehicle owners won’t need to deal with clutch replacement costs that occur with manuals and automated transmissions. Additionally, there is no loss of power between shifts, which occurs in both manual and automated transmissions, it creates fewer distractions for drivers and improves maneuverability. This helps to increase productivity and lower total cost of ownership. 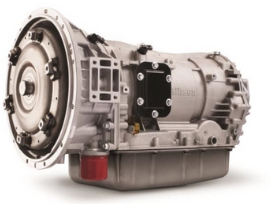 We’ve worked with Allison Transmission for 40 years, installing and servicing Allison products in the Pacific Northwest. Allison recently tapped us to distribute its products in Northern California. We’ve got the experience and expertise to help you decide which transmission to choose for your on-highway vehicle. Contact our experienced technicians to talk about your options.